Summary: Dr. Greg became lost on one of his expeditions and ends up in Korphe, Pakistan. He was sick, cold and hungry. The people of Korphe nursed him back to health. During his recuperation he helped with healing the sick and he also helped the students with their lessons. When he was well enough to leave, he asked the Haji Ali, the wisest man how he could repay their hospitality. He was told to “Listen to the wind”. As he heard the voices of the children, he determined that Korphe needed a school. He left with the promise that he would return to help them build the school. This comes to fruition a year later. He worked with the villagers to overcome all the obstacles by first building a bridge that would allow them to transfer the raw materials for the school. With hope and determination and the whole community working together the first school in Korphe was built. Characterization: Dr. Greg fulfils his promise to the people of Korphe and he returns to help them build a school. 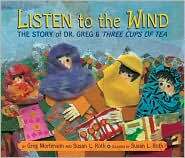 Plot: Dr. Greg’s gives back to the people of Korphe because of their hospitality towards him. The plot shows how much one man with determination and will-power can achieve a desired goal. Style: Story is illustrated with a series of extremely well done collage which gives life to the words in the text. Race: Racially specific and deals with The people of Korphe, Pakistan who were able to show hospitality to Dr. Greg, a Caucasian male in his time of need and who reciprocated by helping them build a school. Culture: Story is culturally specific; Pakistani culture. Girls are depicted as wearing head coverings. The wisest person is Haji Ali a man. The men did all the construction. Women were allowed to carry water to help with the project. 1) When we say we love our neighbor what does that mean? 2) How should we embrace people who are of a different religion and culture than we are? 3) What does hospitality mean? Listen to the Wind by Storypath is licensed under a Creative Commons Attribution-NonCommercial 4.0 International License.